On January 30, 2018, the Express Entry Labour Market Stream of the New Brunswick Provincial Nominee Program opened temporarily for Expression of Interest, for candidates listed in specified priority professions. For the Canada Express Entry EOI, it was mandatory, for the Applicants, to attend the information session, conducted in the past two years to get accepted. Candidates submitting an EOI were required to include the place and date of the information session attended by them, NOC code, and the job title in the subject line. 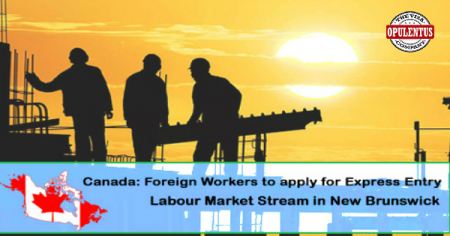 In case of non-compliance, the EOI will not be considered.The persons, who submit an EOI, are required to meet the criteria entirely, regarding the Express Entry Labour Market Stream of the New Brunswick. Meeting all eligibility criteria and factors of selection meant for the FSW Program (like obtaining 67 points from 100). Have an age ranging from 21 to 55 years. Obtain a Score of CLB 7 in English /French covering reading, speaking, writing, and listening. Receive secondary school education, in Canada, or it must be assessed by a designated body when received in countries other than Canada. Possess one year of work experience in National Occupational Classification 0, A or B. Make an undertaking to reside and pursue the profession in New Brunswick. Providing evidence of funds deemed necessary by the federal government to get successfully established in New Brunswick. When the application is sponsored by a job offer, the local Company should have an operational existence for one year at the time of receiving the application. The provincial statement stated that for submission of an EOI, the candidate must meet all criteria of the New Brunswick Express Entry Labour Market Stream, a valid and recent language examination, and an assessment of educational credentials, adequate funds, appropriate working experience, as well as other criteria. When the quota of the province attains a maximum level, the new EOIs will be closed. The place and date of the information session attended; NOC code and the job title must be included in the subject line of the email. In case of non-compliance with this information, the EOI will not be considered. When this temporary opening gets closed, Expression of Interest from persons, presently pursuing work in New Brunswick, and persons holding a job offer, from a company located in New Brunswick, only will be accepted. There was a mention by the province that aspiring candidates listed in occupations which require a license/certificate to practice need to take extra steps before undertaking any work. The holders of Post-Graduate Work Permit are not exempted from the norm of having settlement funds in the Express Entry system. The opening of this stream will not affect other categories which will be kept open in New Brunswick and have secured job offers and French as the first language. NOTE: This Stream was closed to applicants not having a job offer since the publication of this news. The province now accepts applications from aspiring candidates possessing a job offer, or the candidates who have French as the first language who possess experience in the professions.